You are here: Home / About Farming & Food / Why is Ground Beef Brown in the Middle? 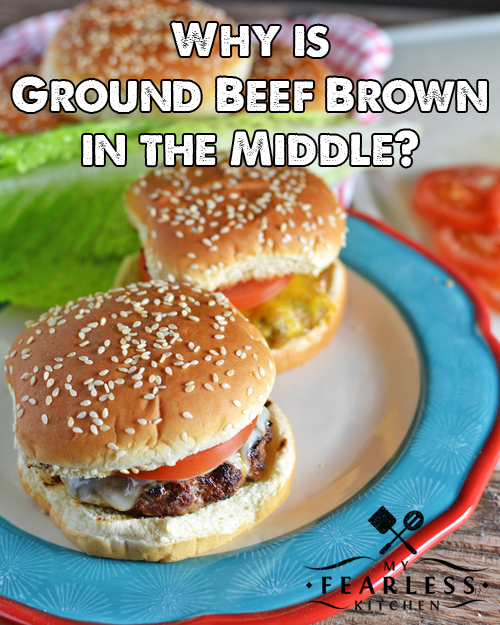 Have you ever wondered why ground beef is brown in the middle, when it is bright red on the outside? The reason might surprise you! We have all done it… bought a package of ground beef at the grocery store. It looks nice and red in the package. You take it out of the package to make hamburger patties or to brown it in a skillet and… it’s brown on the inside, even though it is a beautiful red on the outside. What’s going on? Is brown ground beef safe to eat? Should you eat brown ground beef? Is your butcher trying to trick you? Beef is muscle. And muscle has a pigment called myoglobin. This is very similar to hemoglobin, the pigment in your blood that makes your blood red. Both myoglobin and hemoglobin contain iron (which becomes important in a minute). If you remember back to grade school science, you might remember about hemoglobin. You breathe air in through your lungs. Your blood travels through your lungs, and picks up oxygen with hemoglobin. The hemoglobin turns bright red, which makes your blood turn bright red. As your blood travels through the rest of your body, the oxygen gets delivered to other tissues and taken off the hemoglobin. 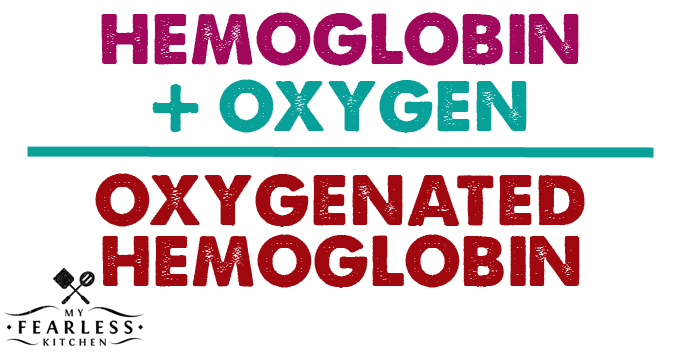 As the oxygen comes off the hemoglobin, it turns a dark red or purple color. Then the hemoglobin gets back into your lungs, picks up more oxygen, and the process starts all over again. The same kind of thing happens in muscle with myoglobin. Check out this great explanation about the color of steaks from Mom at the Meat Counter. In meat, myoglobin starts out as a dark purple color. 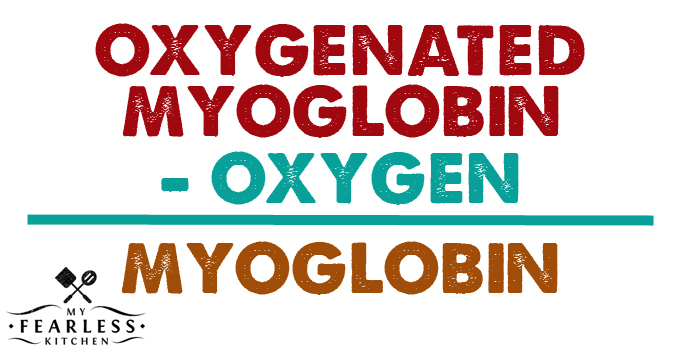 When it is exposed to oxygen (either from hemoglobin in the blood or from the air), it turns red. Enzymes in the meat use the oxygen. In order to use the oxygen, these enzymes take away some of the electrons from the iron in the myoglobin, which turns the myoglobin brown. Other enzymes in the meat give those electrons back, which turns the myoglobin back to purple. Then the whole cycle can start over again. In ground beef, things are a little bit different than in a steak or roast. Because so much of the meat is exposed to air when ground beef is made, the myoglobin gets saturated with oxygen. 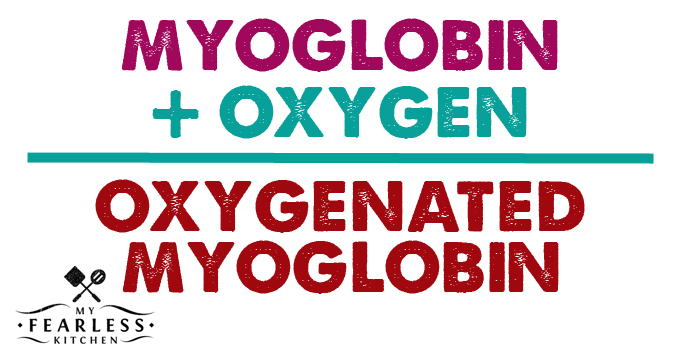 The enzymes that use the oxygen still work, turning the myoglobin brown. But the enzymes that make myoglobin purple again are overwhelmed, and can’t do their job to make the myoglobin purple again. 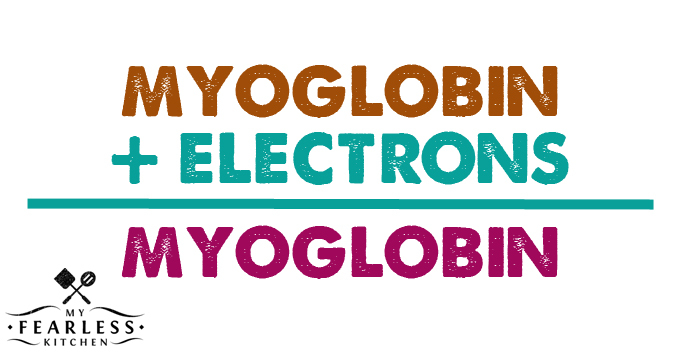 So the myoglobin (and the meat) stays brown. When ground beef is packaged, the outside of the meat is exposed to air again, so it turns that pretty red color. The air can only penetrate so far through the meat, so the inside stays brown. When you get it home and break it open, the brown part of the meat should start to turn red again when it is exposed to the air! Neat, right? Hi Kathryn, thanks for your comment! What do you mean by “turn meat”? I’m not sure what that is, or how it would affect the color. Thanks! What if the entire package of ground beef is brown? Not just the middle portion? You open it up and it is brown all the way through. Should you eat it? If the ground beef starts to turn red when it’s exposed to the air (like when you break the chunk of meat in half), it’s perfectly fine to eat. If it doesn’t, check the dates on the package. It might be getting a little older. BUT brown meat does not mean bad meat – it just means that the enzymes that turn the color from brown back to red aren’t working anymore. As long as the meat is within the expiration dates, it doesn’t smell bad, and there are no other visible signs of “badness”, you should be fine.